As the weather outside gets warmer, you may begin to plan outdoor adventures where you can bask in the bright summer sun. Before you start your outdoor excursions, however, you should create a skin safety routine that will keep your skin protected from the negative effects of sun exposure and summer pests. Below are basic guidelines for an effective skin protection regimen. The FDA has just implemented new changes to sunscreen labeling that will help you purchase the best sun protection products for your family. There are three elements you should look for on new sunscreen labels to determine if the lotion or spray you buy is up to the task of protecting your skin. First, you should check the label for “broad spectrum coverage,” which means that the sunscreen blocks both UVA and UVB rays. Next, you should check the Sun Protection Factor (SPF). 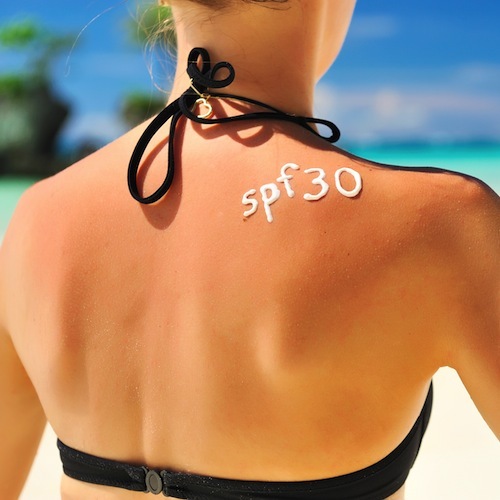 You should select sunscreen with an SPF of at least 30, but a higher SPF is better. Finally, you will want to look at the water resistance of the sunscreen. Until this year, sunscreen manufacturers could claim that products were waterproof with no restrictions on these terms. Now the FDA requires bottles to indicate water resistance in terms of time, so you will see labels marked with water resistance of 40 or 80 minutes. Even if you purchase the best sunscreen on the market, it will be ineffective if it is not applied generously and often. In order to get the full protection of an SPF 30+ sunscreen, you should apply a thick layer to all exposed areas of the skin and rub it in thoroughly. Adults generally need about one ounce of sunscreen to cover up exposed areas, and this will be enough sunscreen to fill the palm of your hand. Throughout the day, you will want to put on a fresh layer of sunscreen after swimming or sweating. If your skin doesn’t get wet, apply sunscreen once every two hours. It is also important to remember that sunscreen needs about 15 minutes to absorb fully into the skin, so you will want to start applying it well before you are ready to go outside. Insect bites and stings can also irritate your skin in the summer. Insect repellent sprays can help to keep pests away from your skin—particularly when you are camping, spending time near water, or hiking nature trails. When you do spray insect repellent on your skin, do so in well-ventilated areas and avoid spraying your face. To apply insect repellent to the face, spray it on your hands first and then rub it on, making sure to avoid the lips, nostrils, and eyes. You should not let young children apply insect repellent themselves, but instead do it for them to ensure that they do not spray sensitive areas. If mosquitoes are particularly abundant outside, you might also wear protective clothing and utilize insect screens to keep mosquitoes away. Stick to these tips all summer long to keep your skin free of burns, bites, and stings as you enjoy the outdoors.